At the most basic level, as well as the very highest, Tai Chi Chuan is a martial art. Every aspect of this art must adhere to the martial principles or it can’t be called Chuan which means martial form or fist. Many people are adverse to the study of a martial art and therefore look at Tai Chi Chuan as a Chi Kung exercise, which of course it is, yet it is a martial chi kung. Many people like Tai Chi as a meditation art, which it is, yet it isn’t a transcendental meditation to take us away from the body, but a natural meditative system with the intention of unifying the body, mind and spirit. With this in mind I want to talk about the role of the hands in Tai Chi Form. The hands are the main tools for our interacting with others and our environment. The hands contain over one quarter of all the bones of the body. 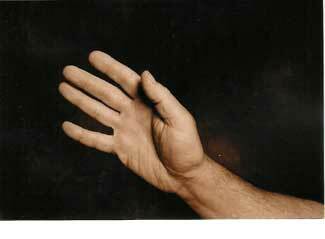 One sixth of all the muscles of the body are used in hand movements. A single hand movement can involve as many as 50 muscles working together. There are as many as 21,000 sensors of heat, pressure, and pain per square inch of the fingertips. The hands can destroy or heal, cause pleasure or pain. Tools are designed to perform certain tasks. A hammer is used to sink a nail, a saw to cut , a screwdriver to insert or extract a screw. Hands are also designed for specific tasks. The long, slender fingers of the monkey are used for grasping branches. The mole has short fingers with broad, strong nails used for digging. The whales fingers are webbed to move through water. Each hand or tool has been designed to get a job done in the best possible fashion. This is not to say that the monkey couldn’t use his hands to swim or the mole couldn’t grasp anything, but each has its optimum use. The human hand is an incredible design. It is very general, not limited to a few very specific tasks, and it has evolved to have almost unlimited possible uses. The hands of the Tai Chi player certainly express this variation of abilities to the fullest. They can grab, pull, push, twist, poke, strike, neutralize, adhere, smash, slap, chop, and more. Most of the time, one hand will be performing one task while the other hand is doing something else. Just as you would never cut a board with a hammer, or sink a nail with a screwdriver, one would not grab something with a fisted hand, or slap with a finger. The fist is used for striking, the finger is used for poking. Most Yang Style Tai Chi players do not change their hand postures to reflect the different uses of the hands in each movement, and I feel it is a short coming. 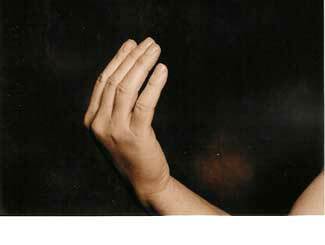 Changing hand postures takes understanding of what one is doing at all times in the form. Changing postures and intention go together and I believe that intention is the master key to success in Tai Chi Chuan. 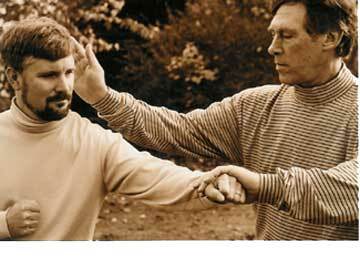 So let’s look at some the hand positions, their uses, and where they are expressed in the Yang Style Tai Chi form. These are the most common hand postures and is not meant to cover all possibilities. 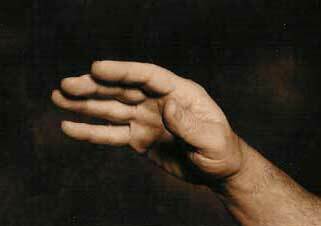 The hand postures reflect the application, so the examples given are only one out of many posibilities. This is the most common hand position ( inactive). It is relaxed with just enough peng in it to keep it aware. 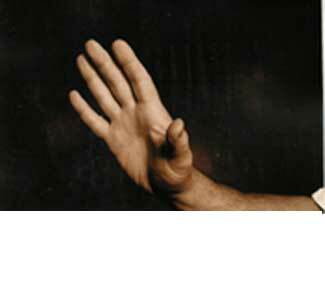 In all martial arts that use open hand techniques, this is the “at ready” hand. A hand is in the normal posture if it is waiting to do something, or if the other hand is involved in activity and it is just relaxing. This posture is used between movements as a transitional hand posture. An example would be waiting to go into Fist Under Elbow, or the waiting in Repulse Monkey. This hand posture is quite open, with a large open space (lots of peng) between the thumb and index finger. This ability to grasp and clasp things between the thumb and other fingers has allowed man to reach the top of the survival pyramid. This posture is very active, ready to grab and twist. It is not good for strikes as the energy would be dispersed over too large an area and the thumb is vulnerable to attack as it sticks out. Examples are the left hand in Left Brush Knee, the pulling hand in Repulse Monkey, the right hand in High Pat on Horse. erect, slightly back. The main area of energy is in the lower palm, as the bones of the forearm are quite close to the surface here. 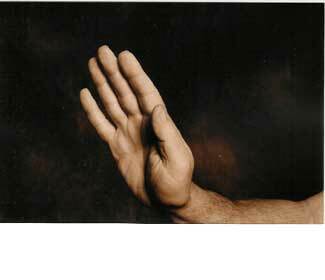 This palm allows a great deal of concentration of hard jing (yang) with the purpose of sending energy deep into opponent’s body. 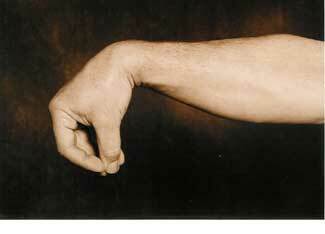 Examples include Brush Knee (the striking hand), Repulse Monkey (striking hand), Fan through the Back. Probably the most common active hand posture, the pushing or neutralizing hand is an intermediate step between the Relaxed Hand and the Tiger’s Mouth. It is soft enough to be able to mold to the surface it is attached to, yet firm enough to transmit solid energy. The thumb is held closer to the palm then Tiger’s Mouth, and the fingers have a bit more spread then a Striking Palm. Examples include Push, Withdraw and Push, Brush Knee, Roll Back ( right hand). This is an open hand with the thumb held fairly close to the palm. 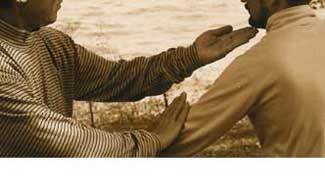 It is a softer hand posture then striking palm as it is used in a whip like fashion with out the intention of energy penetrating deeply. 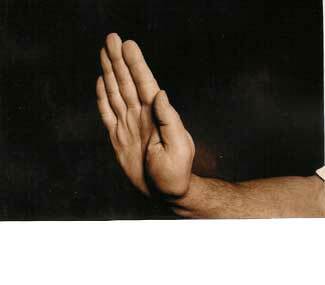 This slapping palm is used to confuse the opponent and to set up other movements. An example is High Pat on Horse. The fingers of this posture are held together firmly, have lots of peng energy,and the thumb is tucked firmly into the palm. The energy is concentrated on the edge of the hand that is used to do the chopping, and can be done in an upward or downward motion. An example of downward chop is Deflect Downward and an example of upward chop is Slanting Flying. The hand is held very firmly, fingers straight, thumb tucked tightly into palm. It is very important for the forearm, wrist, palm, and fingers to line up straight, as the poke puts a great deal of stress on the joints if not in line. Examples include Plane Cross Hands, Needle At Sea Bottom and White Snake Puts Out Tongue (left hand). This is a very difficult hand posture to master as the area of energy release is quite limited due to the fact that the bones on the back of the hand are quite close to the surface and therefore easily broken or damaged if not used correctly. This posture is used mostly to stun or distract, focused generally on the face and especially the nose. The shape is rather round with most of the energy in the knuckle region. An example is White Snake. 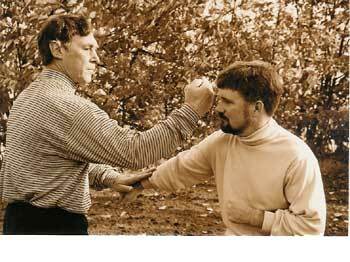 The fist is used in many ways in Tai Chi. One can punch, chop, use front, back, sides. Knuckles can protrude to concentrate energy into small areas. The most common fist is the straight punch, like in Step Up, Parry, and Punch. Be sure to close the fist firmly but not too tightly. 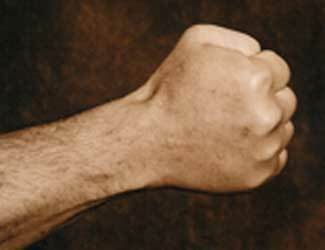 The energy for the most effective forward punch comes from the two large knuckles of the index and middle fingers. 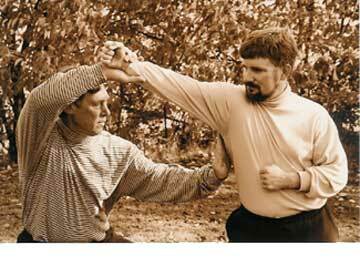 Be sure to line up the forearm, wrist, and hand so that all force comes from the back and nothing will bend out of shape when the force is released.When we punch in Tai Chi we usually use a half twist ( ending with the thumb of the punching fist facing upward) to help focus and concentrate the energy. We don’t use a full twist (ending with the fingers of the punching fist facing down) as that puts a lot of stress on the connective tissues of the shoulder, elbow, and wrist. This is the hand position for Single Whip. It is a very versatile tool used for striking ( mainly sides but also knuckles, wrist area, and back of hand), poking (fingers concentrate energy into a small area), neutralizing (fingers wrap mainly around wrist of opponent). In the long form of Yang style, there are 10 Single Whips. I do a different variation for each so I can practice more of these interesting possibilities. 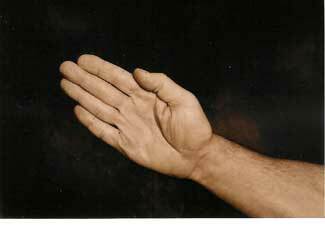 Let’s now look at some of the Tai Chi movements and see how these hand postures fit in. The left hand is a striking palm while the right hand is in tiger’s mouth.I could easily grab his right wrist with my right hand, but, since he is holding tightly onto my wrist, I just need to withdraw my arm and he is closed up and vulnerable to my palm strike. 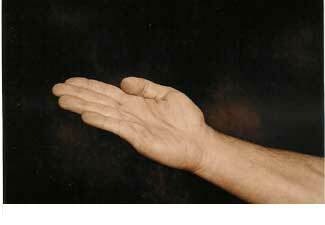 I am using a neutraling palm with my right hand, pressing slightly down and in, while I poke with my left hand. You can see if I used a Tiger’s Mouth with the left hand, the thumb might get in the way and dissipate the jing. I have many applications for Single Whip. Here I use a Tiger’s Mouth to grab his left wrist with my left hand and strike his ribs with my hook hand. I use a neutralizing hand with my left hand and strike with a back hand slap with my right hand to Rex’s nose. The bridge of the nose is an excellent target for this tool as it doesn’t take a lot of force to cause pain. I use a Tiger’s Mouth with my right hand to grab and pull a bit in order to open his rib area so I can strike with a striking hand. I could use a fist also with good results. This is an interesting movement. I am blocking his right hook punch with my left arm. This is called a blocking punch because I am punching his right temple at the same time I am blocking. 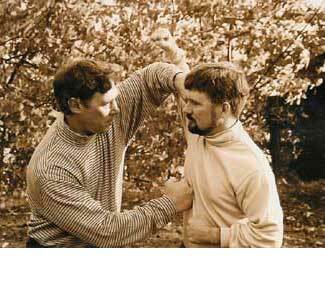 It takes some practice to use blocking punches, but once mastered, they are very effective. My right fist punches his center. This is a very powerful punch – short range with the entire body behind it. 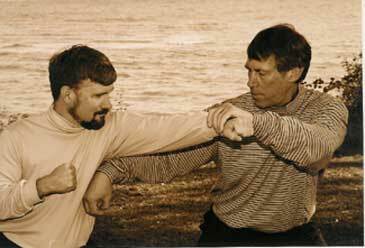 You will see some practitioners do this movement punching both fists at the same time. I like to do the left arm just slightly before the right. High Pat uses a left hand Tiger’s Mouth for a grabbing neutralize as I slap Rex’s left ear with my right hand. I could have used a neutralizing hand on his left punch, but my slap is much more effective when I add a slight pull to his wrist, upsetting his root and balance. I hope I have given you some food for thought and I encourage you to explore the almost unlimited possibilities that the hands present to the martial artist. Paying attention to the changes in hand postures will help you focus and keep your mind from wandering thereby increasing the generation of Chi. For those of you interested in self healing, changing hand postures causes a greater variety of energy transmission pathways and mind/body interaction, both of which lead to improvements in health. Meditators will find deeper involvement in understanding the form will contribute to a richer and vastly more interesting experience. I would also like to thank Sifu Rex Long for helping me out with this series. And special thanks to Marvin Smalheiser, publisher of T’ai Chi Magazine, for letting me reprint this article that appeared in Vol. 24, No.1 February 2000 issue. 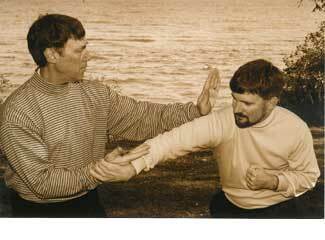 T’ai Chi Magazine remains a great source for information on the internal arts.